I have been in the practice of cosmetic plastic surgery in Rockville and Annapolis, Maryland, as well as McLean, Virginia for over two decades. In that time, I have gotten to know countless patients and help to guide them on the proper path if they are considering cosmetic plastic surgery. 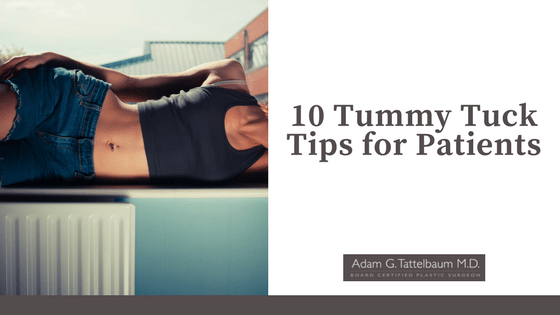 Below are what I consider the best tips I can give when considering abdominal enhancement. All surgeries have risks and my job as a Board Certified plastic surgeon is to minimize those risks. It’s not a good idea to take a high-risk patient into elective surgery. Medical conditions don’t always mean you can’t have a tummy tuck, but risks must be well controlled. Each year, especially before the Summer and school vacation I see many patients who want surgery within a week or two. While I would love to accommodate, our spots before all holidays go before other times, often a few months ahead. If you are thinking of school breaks or holidays, please plan well ahead. Often people consider surgery just before the warm weather of the Summer. If you want to be ready for Spring or Summer try to plan surgery 4-6 months ahead, so you can be ready for the warm weather but not recovering during it. It’s not common for most women to get to their pre-pregnancy weight after childbearing. Some do, but it takes a huge commitment. If you are going to do this, be at least at a reasonable weight. Your surgery will be safer and more gratifying. Both are my goal. So much of what we think about cosmetic surgery is put forth and sensationalized by the media. It has led many patients into fad diets that have failed, exercises that don’t fix muscle separation and bad liposuctions. I often have to walk my patients back from fictitious “facts” they have gleaned from the internet. It is not uncommon for me to tell patients things they had not considered. It is my hope though that when they leave my consultation, the concepts make intuitive sense. Nobody comes to our office specifically asking for a tummy tuck, but if your plastic surgeon recommends it, at least learn about it. Most patients come in seeking liposuction. In my experience, about 80% of postpartum mothers coming in for abdominal enhancement write “liposuction “on their intake forms. For a select few that may be the right answer, but most postpartum mothers and weight loss patients have loose skin and liposuction will make it looser. If your skin is loose, it needs to be tightened, and even today there is no liposuction device which tightens skin as well as a tummy tuck. It breaks my heart when some, who have not listened, come back after a poor result with liposuction, and then ask for a tummy tuck. The tummy tuck is then harder and may be less gratifying as the skin is less stretchy. The process of a tummy tuck is a shared process. The person taking care of you after surgery will need a lot of information and it is unfair to spring all that on the day of surgery. If the person who takes you to and from surgery and cares for you after surgery is involved from the get-go your experience is often easier and more importantly safer. Often the most terrifying part of considering a tummy tuck is thinking about the scar. Even worse, scars are controlled by genetics and can be unpredictable. I always ask my patients to play what I call the “worst scar in the world” game. If you had a bad scar, would it be worth it? Thankfully most patients only have normal scars, but it is still safest to play this game so that you can be comfortable regardless. Many patients want to “beat the surgery” and show me how terrific and active they can be early on—don’t do this. Even if you are having an easy and perfect recovery, your body needs the time to heal correctly with common sense activities under my supervision. Patients who give themselves healing time at the beginning actually recover faster and better in the end. As you consider your surgery, be sure you can take enough time off. Almost every day, I get an e-mail from a patient with a list of lotions and potions or gizmos and gadgets, asking if they should purchase anything to hasten or improve their recovery. There is no end to post-surgical paraphernalia that some websites want to sell you. In my opinion, your best Items will be pillows, perhaps an old recliner and a caring significant other. I don’t object to most scar lotions and silicone strips, but it is clear to me that simple scar massage and your genetics are the most important factors in your healing. This is perhaps the most important point. As a plastic surgeon, I cannot make you thin. Only you can do that through a healthy diet and exercise. I like to tell my patients I can get rid of loose skin and fat, change contour and make them more streamlined. It is an honest and realistic distinction and I hope it makes sense to you as well. Of course, there are probably dozens of other things I could discuss, but that will have to wait for your consultation. If you would like to schedule a consultation, contact us today. Dr. Adam Tattelbaum can be your Rockville plastic surgeon.